What do you do when hatred is the only thing that gives your life meaning, and your enemy is dead? His enemy is dead and his life no longer has meaning. Then his old friends Redbeard and Njal tell him one last Omega cell survives in Mexico: Deep in the jungles of Sinaloa Felipe Gonzalez, Samuel ‘el Vampiro’ Zapata and General Francisco Ochoa are building a lab above Cosalá. Lacklan knows it is time to strike the death blow, but is it honour - or is it hatred? Lacklan only knows he must Kill General Ochoa, the man known as Omicron - before it is too late. BLUSH FACTOR: The eff-word frequency will likely dissuade you from reading this novel to your youngsters or to your prayer group. POV: First person, which lends it a sense of immediacy. Also, though, you will be excused if you think the narrator is a bit of a braggart. In the navy we had a guy similar to him that we used to be enthralled by his ‘sea stories.’ We knew they were mostly his own imagination, but they were SO interesting. WRITING & EDITING: As I alluded to, the guy is prone to a violence addiction that, frankly, is beyond belief, on the one hand, and insane on the other. What I mean is, if he is truly working undercover in a James Bond way, the bar fights would tend to signal to the bad guys just where he is. A smarter ploy might have been to have him more mild-mannered. Yet, at the same time, the action scenes for these fights are great writing. The storyline is not one that most readers are likely to get passionate about. At least not in a favorable way, I suppose. But, I love the Action-Adventure genre, so I enjoyed the way the writer worked philosophy into the novel, even IF in so doing, he had his hero mulling over mostly pointless thoughts. Hey, few writers, anymore, even try this tact, so I applaud the author. I am striving to produce reviews that help you find books that you want, or avoid books that you wish to avoid. With your help, my improvement will help readers find books they enjoy reading. 5.0 out of 5 starsA home run and then some. This one starts with Lacklan Walker in a bar in New Mexico. He's been looking at Greek symbols. Lamda, Mu, Nu, Xi and Omicron. He know what they mean. He also knows they are part of Omega. The more advanced part. Walker has gotten into fights in every bar he's been in for the last few weeks. He's been arrested a couple of times and this bar is no exception. Four good old boys walk in and right away Jessie, the biggest and dumbest picks a fight with Lacklan. Walker isn't a guy anyone wants to pick a fight with. He's spent ten years in the British SAS. He left a couple of years ago as a Captain. He'd been deployed to Iraq, Afghanistan and Africa and basically all over the world. He's one excellent and very capable warrior. The fight with Jessie ends and the Sheriff tells Lacklan he'd better leave. Getting into his Zombie he calls Jim Redbeard and tells him he'll be there for a meeting. Its a meeting where he and Njal will be going to Argentina, Bolivia an Mexico. They will be killing member of Omicron, or a greater Omega. Killing the first two is easy. Its the last on the list that will be hard as they are in Sinaloa, Mexico at a fortress. After getting a look at that fortress Njal and Lacklan decide it won't be easy but with proper care its doable. This one has Lacklan, a Lacklan who is beginning to tire of all the killing, Njal, a Njal who want to be sure Walker's head is in the right place for the mission, Jim who makes sure they have all they need to do the mission, a mission that's starts out easily and is easy to do, kill two and then head for Mexico, a fortress that isn't so easy, a woman named Sole who is Red's wife, she moved back home and Red wants her back in LA, a Lacklan who can make that happen, a Njal and Lacklan who make it to the fortress, recon said fortress and realize this won't be easy, a Lacklan who is wondering is brother Ben is still alive, a General Ochao who tells him he has a powerful friend who wants him alive and Lacklan Walker and Njal doing their best to follow the plan, survive and stay alive. 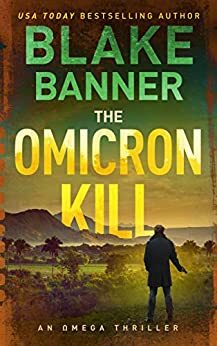 “The Omicron Kill” is Book 11 in Blake Banner’s ‘Omega Series’. It is another thoroughly entertaining story that will keep you turning the pages. Walker is still obsessed with terminating the Omega Organization and finds him traveling to South America and Mexico to carry out the job. 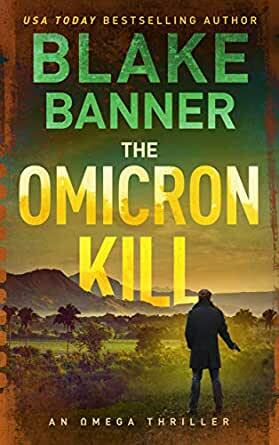 Mr. Banner’s description of the locations, people and actions bring the story to life as though you were there alongside Lachlan in the midst of all the action, intrigue and danger. While each book can be read as a ‘stand-alone’, you’ll enjoy the experience much better if each book is read in order. 5.0 out of 5 starsBanner is One of the Best!!! !